Naked Investing: Bruce Krasting: The Swiss Did It!? 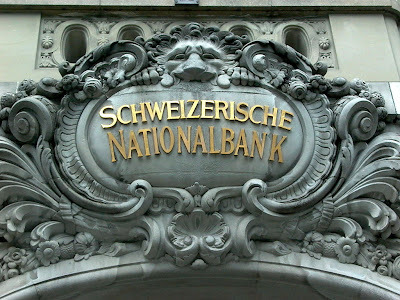 -As of 3/31/2010 the SNB had Euro 53b in reserves. They reported that these holdings had a mark to market loss for the Q of CHF3.1b ($2.9b). 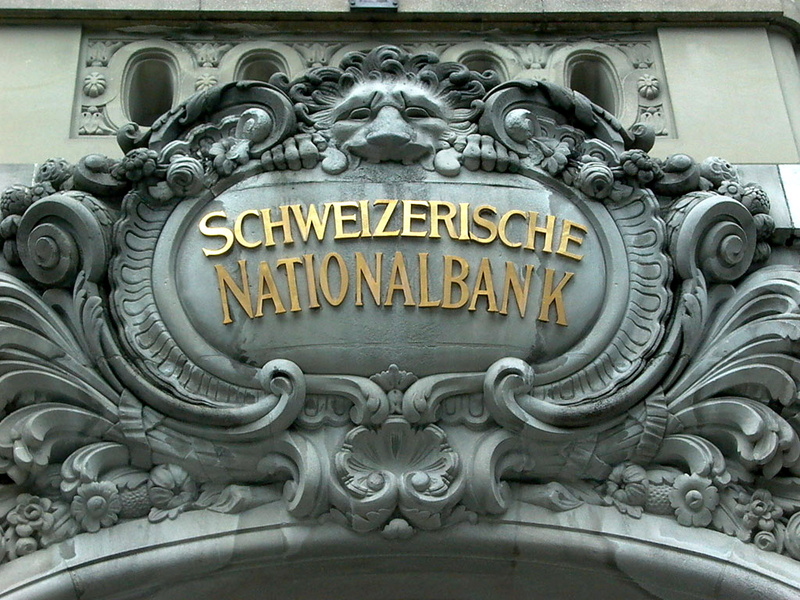 The NZZ has reported that SNB purchased an additional Euro10b in April. It should therefore come as no surprise that the SNB bought more Euros and sold more CHF in the past day and a half. -The graph shows that the FX rate was just a tad above 1.40 for a few days prior to the blow up. 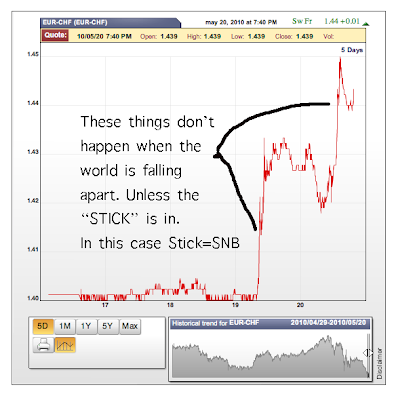 I suspect that this was the SNB providing support to the market on an ongoing basis. These are stabilizing efforts. It is a “containment" policy it is not “shock and awe”. -The night of the Merkel “no trading” rules the Euro/$ hit a new low. Logically there would have been pressure on the Euro/CHF. But it held. Here I suspect that “resting orders” were in place to continue the containment. -Watching the market on Wednesday I concluded that there were three separate rounds of intervention in the E/CHF. Each resulted in a spike in the rate and then a resumption of trading. The end result was a 2% backup. That is a big move in this cross. This activity all took place during peak European and NY FX markets. At that time there are thousands of players. The market is deep and big numbers can get done. The intervention required to move the market this much would have to be more than Euro 5b. -The E/CHF rate was fairly quite today. Until 2 pm. Then another demand driven gap upward. I saw no reason in the other markets for this gap. If a “real” market player wanted/needed to buy size E/CHF they would not have done it a half-hour before the futures close. This stinks of “Shock and Awe”. -The E/CHF market is a derivative of the $/Euro and $/CHF. To unwind demand for E/CHF one could buy $/CHF and sell $/Euro. The crosses have to match out with the cash prices. During European trading the CHF crosses all have big floats. But in late NY markets they do not. So if a big buyer of E/CHF appears it will result in a seller of $/Euro. (Demand for Euro). This explains why the E/$ rate went ballistic this afternoon. But why? I am not sure. There could be many motives at play. NYF: “Suits us, Have at em. But one suggestion, do it at 2 pm. A few weeks ago a size order in Chicago at 2:30 caused a 10% micro burst in equities. Maybe you can do that again today. Wouldn’t it be a hoot if we actually killed a whole pack of wolves! I don’t have a pipeline into the NYFed, the ECB or the SNB. This "take" on the market action in the past few days just lines up with the facts. If I am right, there are a few conclusions. -The monetary authorities are very worried and are willing to use aggressive strategies to calm instability. -Using the SNB as a single source of global currency intervention will not work for long. The ECB and the Fed are playing weak hands. They know if they intervene and fail it is lights out. So their active/visible participation is a last resort option. -Another chapter in this story will be written soon. Possibly this weekend.